Based on stable economic growth and a considerable number of enquiries from both foreign and domestic investors, experts predict that merger and acquisition activity will reach record highs in 2017. According to Stephen Wyatt, country head of JLL Vietnam, the Vietnamese economy, which is performing well, is widely considered one of the best performers in Southeast Asia. “We expect to see considerable activity in all sectors of the market, with a positive focus on low-mid end residential in cities, the Ho Chi Minh City office market, hospitality, and industrial,” Wyatt said. In 2016, merger and acquisition (M&A) activity from Asian nations such as Japan, South Korea, and Thailand increased stably, and this trend will continue in 2017, according to Chris Freund, general director of Mekong Capital. “Based on the meetings which I have taken with many foreign strategic investors, I confirm that M&A in 2017 will be more active,” said Freund. Real estate is predicted to be the highest performing sector, followed by agriculture, fast-moving consumer goods, retail, and pharmaceuticals. “All the foreign investors that Mekong Capital has met with are paying the most attention to those fields,” Freund said. The real estate market in Vietnam has been in recovery since 2013. In the last three years, the market’s scale has been increasing, with a range of new projects resuming operation after long delays thanks to M&As. Many investors and developers have considered M&As one of the most successful methods to get into the current market. Looking back at the expansion of many key developers in the real estate sector, M&As were one of the greatest factors that helped them to capitalise on opportunities in the market. Via M&A, many developers have been rapidly growing. For example, locally-owned Novaland, with only four projects in 2013, now has a portfolio of over 40 projects which are in total of 9.8 million square metres of floor. Dat Xanh, another domestic developer, also took over seven projects via M&A in 2016, increasing its portfolio to 20 projects. The trend of M&A is clearly apparent thanks to the range of incoming projects for many developers. Hung Thinh, a developer based in Ho Chi Minh City, announced that it had bought 12 projects in the city area and will bring them to market in the near future. Le Hoang Chau, chairman of the Ho Chi Minh City Real Estate Association, said that 2017 will be a perfect time for developers to engage in M&A activity in the real estate sector. 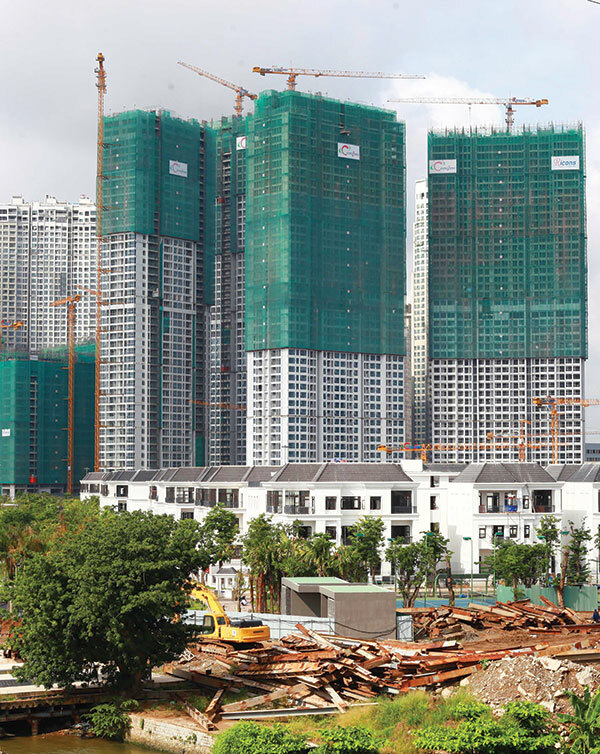 “In Ho Chi Minh City in particular, over 500 projects have been delayed for a long time. These are good choices for developers who can finance an acquisition,” Chau said. According to JLL Vietnam, M&A activity within the real estate sector in Vietnam has witnessed a substantial increase in both transaction volume and value in the last two years. With many countries around the world suffering from limited growth, Vietnam has emerged as a shining star within Southeast Asia, attracting strong interest from a host of foreign investors from all over the globe. While the capital flow into the Asia-Pacific region has showed signs of a slowdown, the real estate market in Vietnam appears to be attractive to foreign investors, particularly from Japan, Korea, and Singapore, JLL Vietnam said. Hanoi, Ho Chi Minh City, and the major tourist destinations throughout the country are on the top of the list for most investors. The key factor supporting M&A activity in Vietnam is GDP growth, desirable demographics, increasing disposable incomes, and rapid urbanisation.